But actually getting a laser deployed is a challenge. When the Air Force first developed a directed energy weapon in the early 2000s, it was so large it took up an entire modified Boeing 747. The Navy's test version, installed aboard the amphibious transport dock Ponce, is estimated to weigh more than could be lifted by the average aircraft. Plus, the technology has to go through the usual testing, analysis, budgeting, purchasing, concept of operations, planning, approval and training before it can ever take off. "You've got to have a wheelbarrow full of paper before you get a wheelbarrow full of money," joked Lt. Gen. Bradley Heithold, the head of Air Force Special Operations Command. "Well, we're busy filling the wheelbarrow full of paper." Heithold said the Air Force needs the capability to silently and quickly sabotage enemy systems without raising alarm – an option afforded by the silent and invisible lasers. "I'm a firm believer that it's time we take directed energy in the form of high-energy lasers and move it into the battlefield on an AC-130 gunship," Heithold said. "The next weapon is a directed energy weapon." A lot of pragmatic challenges remain for directed energy weapons to become reality. Heithold said some of the biggest issues are the size and weight of a potential laser before it can be installed on a plane. "You get 5,000 pounds and you get that pallet position. Design it to fit in that area," he told the conference, motioning to an area forward of the wings on a C-130. Lt. Gen. William Etter would also like a laser, but for a different mission set than Heithold. As the commander of the 1st Air Force, it's his job to keep the skies over America safe. That could involve using a laser to knock down an incoming missile. But using a laser to hit a missile means making sure the laser doesn't cause collateral damage. "We've got an additional consideration, though, and this is pretty important to us: We've got to make sure that we don't hit the other folks," Etter said. "Because in the homeland we have civilian airliners, we have small aircraft, you can range even up to a satellite. … We have to be exactly precise." 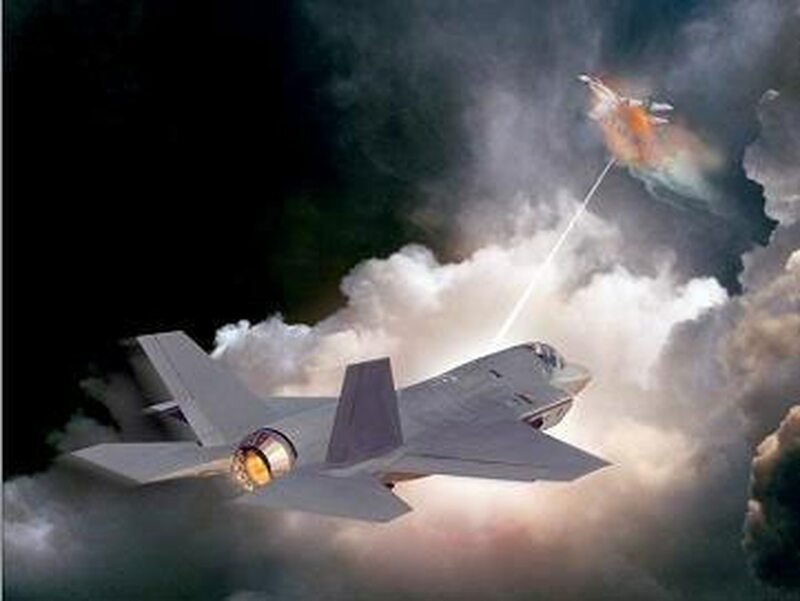 Etter also wants a laser small enough to mount on a plane, since a directed energy-equipped F-22 or F-35 could quickly travel to whichever part of the nation was under threat from incoming missiles. Directed energy could also fill in an emerging gap in missile defense, the ability to hit fast moving targets, he said. "We currently don't have anything that's going to shoot down a hypersonic vehicle," Etter said, referencing missiles that can travel at speeds of Mach 5. But — like Heithold's wheelbarrow of paperwork — directed energy needs support in the terms of governing rules and regulations. "The policy has not kept up with the threat," Etter said. "The policy's actually more difficult than the actual technology. I need rules of engagement. Are we shooting down a [small drone], are we shooting down an aircraft?" It's something that military leaders and lawmakers have tried to start to address. Under the National Defense Authorization Act currently being debated in Congress, the Senate is deciding on a bill that would allow directed energy technology to use rapid acquisition channels to more quickly field the capability. Meanwhile the House has introduced legislation that would create a "Director of Directed Energy" position at the Pentagon. Both amendments are still being debated, and wouldn't be final until the NDAA is passed. And there's going to be a whole host of other things to consider too, not the least of which will be getting airmen trained on the systems. "It's going to take confidence building," Lt. Gen. (ret.) Henry "Trey" Obering told Air Force Times. "It's going to take tabletops and war-games and exercises." 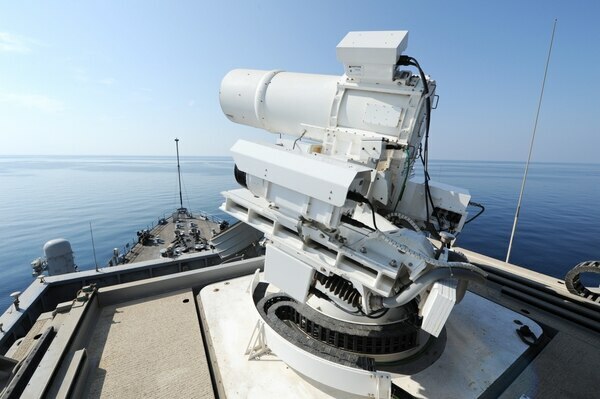 The amphibious transport dock Ponce conducts an operational demonstration of the Navy's Laser Weapon System while deployed to the Arabian Gulf. Air Force leaders are hoping to take lessons learned from the Ponce experiment and apply them to plane-based lasers for AC-130 gunships and, eventually, fighters like the F-22 and F-35. Obering, who now works on directed energy issues for Booz Allen Hamilton, said the technology is going to require a gradual culture shift within the Air Force and the broader military. "You make sure [airmen] are understanding and educated on what the potential and what the capabilities are, and they in turn begin to understand how they will fit that into their tactics, techniques and procedures," he said. It could be something as simple as getting airmen comfortable with the fact that they're firing a weapon that's invisible and makes little noise. "If you have a pilot that's used to hearing the growl of an air-to-air missile as it sees a target, or is used to feeling the bump of the aircraft when he drops a bomb, that interaction [is] about what's the weapon doing versus what I'm doing," Obering said. "When I was head of the Missile Defense Agency and we were flying the Airborne Laser, the crews were a little bit concerned because they would know when the laser was firing only because they could hear the vibration in the back of the plane from the generators," he continued. Part of that will involve training with directed energy weapons "so that when the pilot goes out he or she understands what are the effects, when is it useful," Obering said. Multiple defense contractors are all working on versions of directed energy laser and microwave weapons. To make the transition to the military go more smoothly, Obering said he believes there needs to be a "modular, standardized architecture," for the systems to ensure that they will work together. That way, the Air Force won't have to worry about attempting to cross-stitch together a working laser from a bunch of parts provided by different companies. Heithold, meanwhile, noted that his AC-130's already have green targeting lasers, with not much more power than a laser pointer. "I can scare the hell out of people with a green beam," he told attendees at the conference. "Just put that on them and watch them scatter. They'll stop what they're doing because they know what's behind the green beam. What I want to do is put a little more energy in the green beam, and I don't want them to see it and I don't want them to hear what's going on."